Time to Sausalito downtown: Depending on your bike and on your number of stops to rest and take pictures. 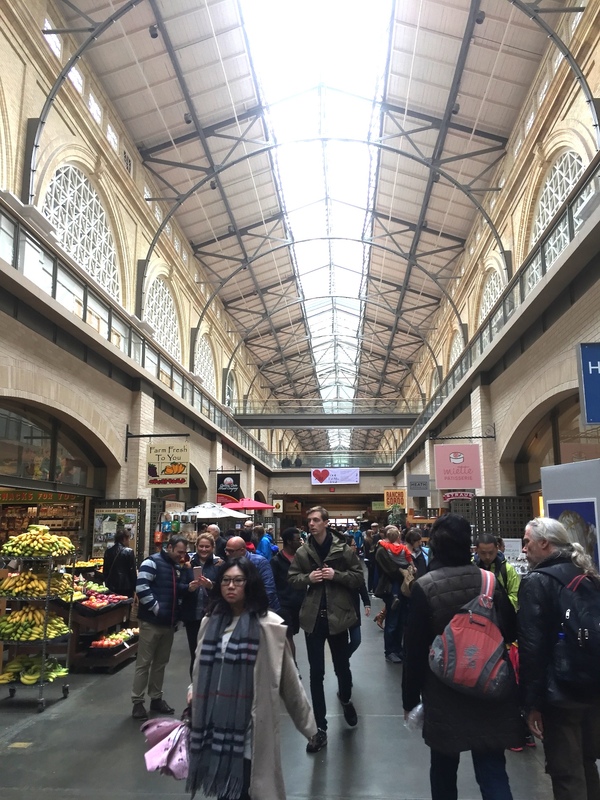 From the Ferry Building, consider a bit more than an hour without stops and no more than 2 for the most relaxed and touristy bikers. Length of the trip: About 11 miles. Difficulty: Well… it is not the easiest ride as you will find many steeps hills on the way, but it worth every single effort! Type of bike: I suggest you rent a road bike so you have enough gears to face the hills, but any bike type will do the job. We did the trip with a city bike and we were absolutely fine, just a bit more sweaty at the end! 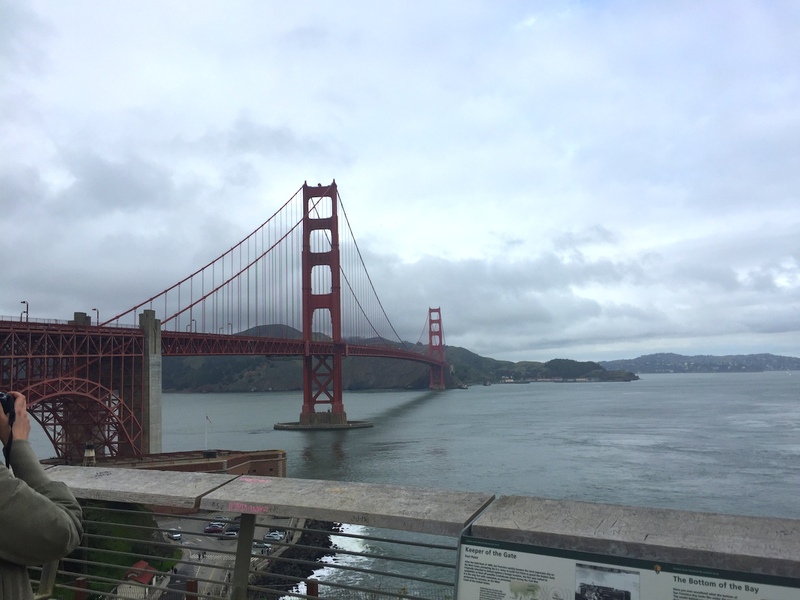 Bike Rental: there are no bikes available to rent at the Golden Gate Bridge. You will need to rent the bikes in San Francisco. There are many places to rent around. I can recommend you Blazing Saddles. Be ready for a beautiful ride and day trip. 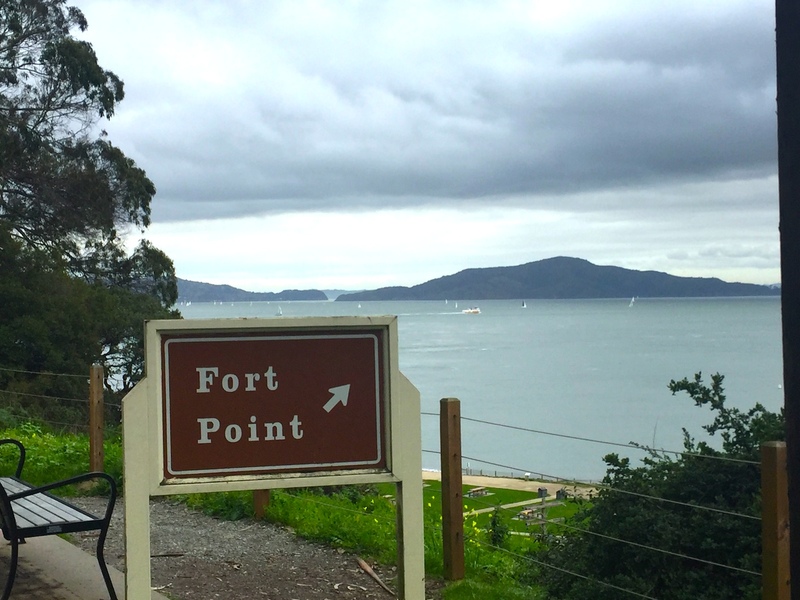 This was a great experience that should be a must-do in San Francisco. 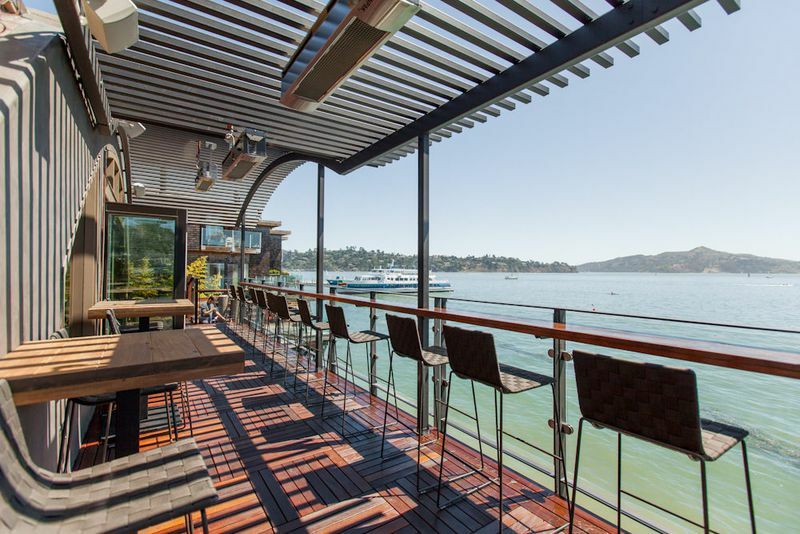 Besides, you can either choose to return by bike or as we did, do just one way as you can get the ferry from Sausalito back to the city with your bikes. We did this trip in February so weather was not the best. Luckily the rain held until we got the ferry back to the city. 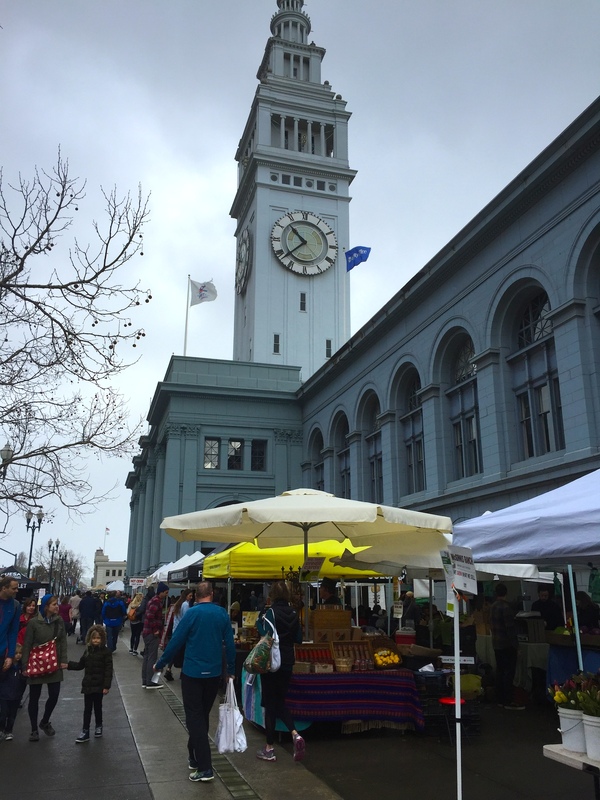 If you have never been to San Francisco, make sure you visit the Ferry Building Marketplace. The building is a ferry terminal but most importantly a food market hall with vendors from all over the World. Be aware that no dogs are allowed inside. We then locked the bikes, had a great lunch and one of the best coffees in town at Blue Bottle, and started our journey! The route to be bridge is pretty straight as you can see on the map below, and it is a good way to visit all different piers. 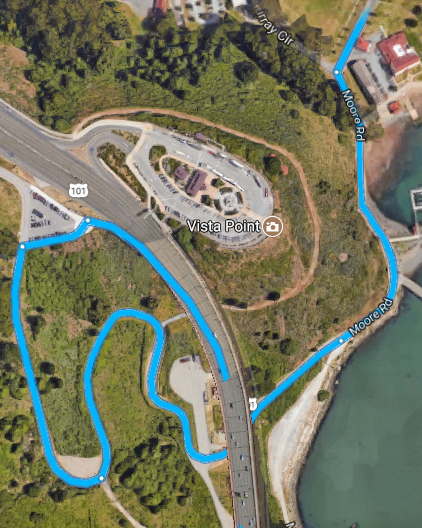 Please note it is a bit trickier after crossing the bridge to find the correct route to go to Sausalito, please ensure you read the final part of this post. 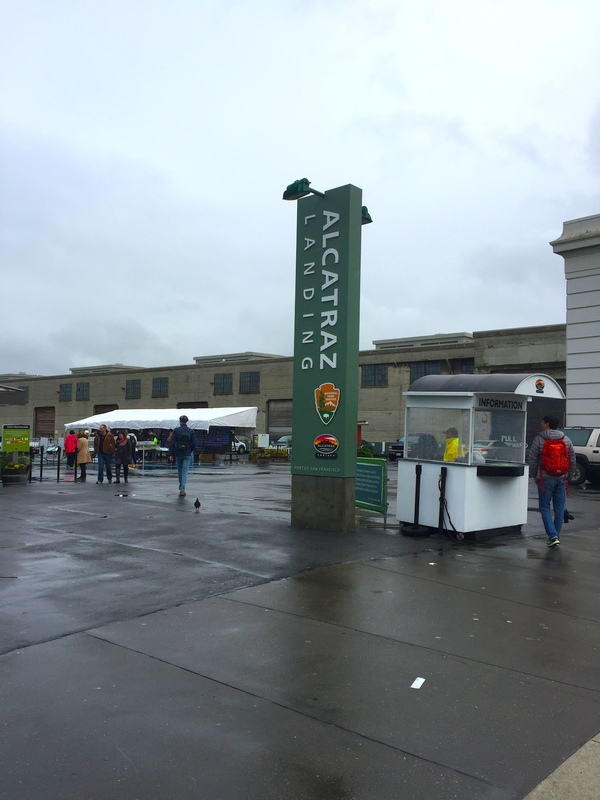 We passed by the Pier where ferries to Alcatraz depart and then we reached the famous Pier 39. 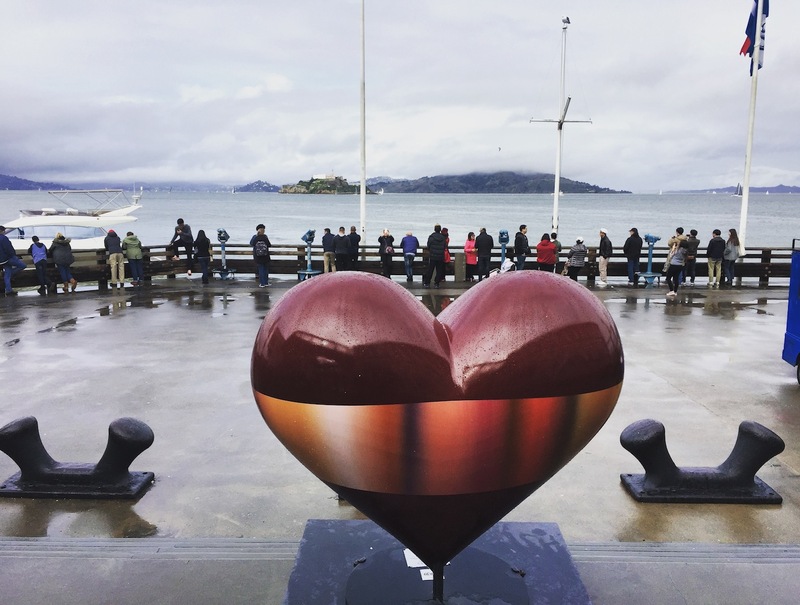 Pier 39 is a popular tourist attraction in San Francisco. 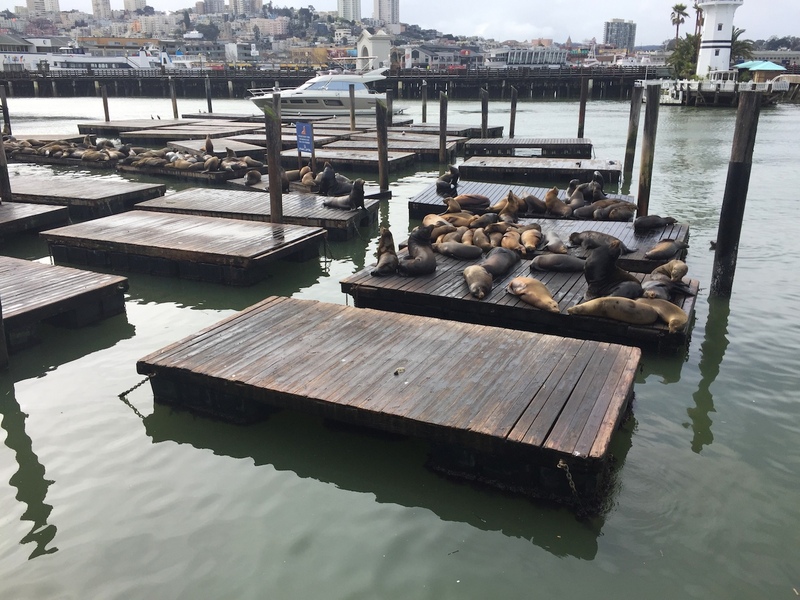 There is a shopping centre, shops and restaurants, an aquarium and views of California sea lions hauled out on docks on Pier 39’s marina. We did not like it really much to be honest, but you should definitely make a stop there to take a picture. 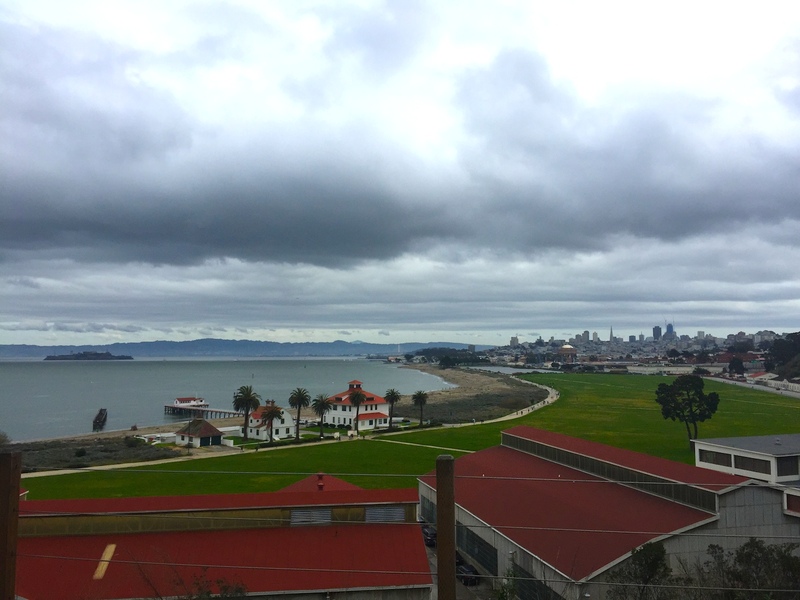 We continued up to Fort Mason Park and entered the Aquatic Park Pier, a really long pier that allows you to have nice views from the bridge already and from the other part of the city. The first steep hill is right after this park, so be prepared to lower your gears and make some effort. In the picture below you can see how steep it is if you compare it with the bay behind. After this hill, you will go down again for a short flat ride, when the real climbing begins. Some views along the way. Getting closer to the bridge! The bridge’s length as a whole is 2737 metres. There might be strong winds when crossing it even when the weather is great on the bay side. Ensure you wear good windbreaker clothing. Electric bike riders: the power can’t be switched on the bridge. You should either push them or ride them with the power off. 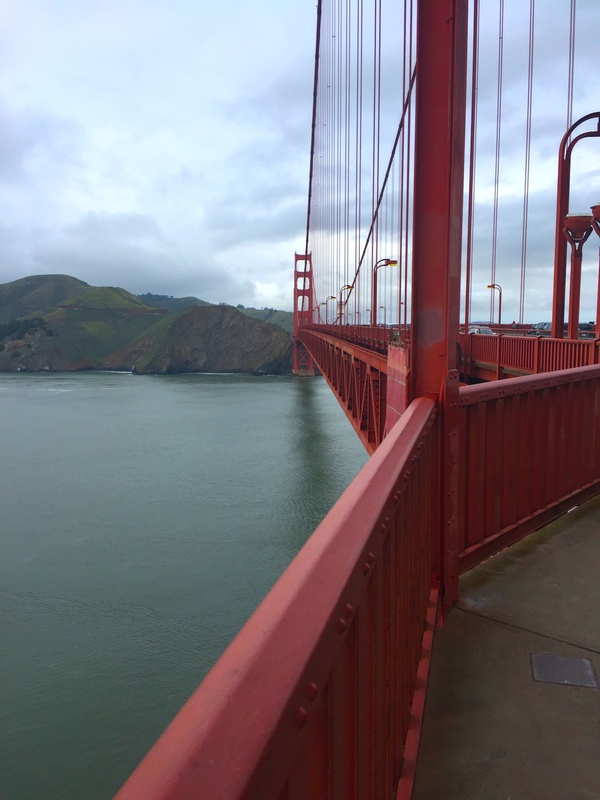 The Golden Gate Bridge offers 24-hour access to bike riders on the sidewalks. Depending on the day, bikes will have only access on the east or west sidewalk, and the other side will be only for pedestrians. This is a great method to allow bikes go faster and for pedestrians to be safe. To visit the other side, there is a tunnel beneath the bridge so you can always park your bike and take some pictures. We were amazed while crossing the bridge. It is an amazing experience and I highly recommend it! 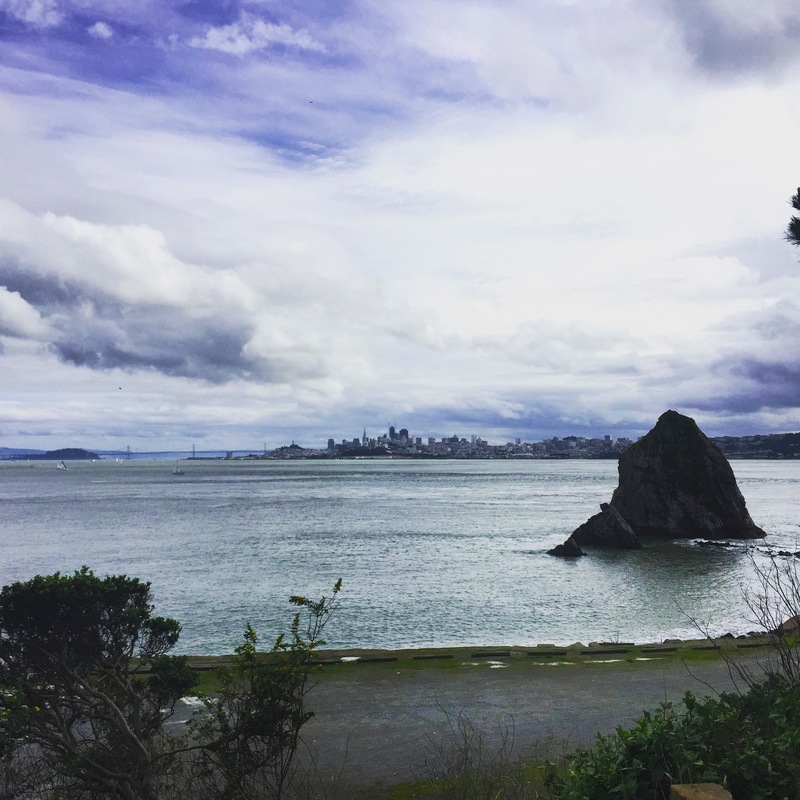 Once you reach the other side, you still have a bit more than 2 miles to Sausalito Town. You need to be careful and ensure you take the newest route, the Conzelman Road. At the beginning of the post, I showed you a Google map and mentioned it is a bit tricky to get the correct route as the GPS does not usually get this new route as default. If you have a look, I purposely added point B (Bay Area Discovery Museum) so we can get the correct route displayed. 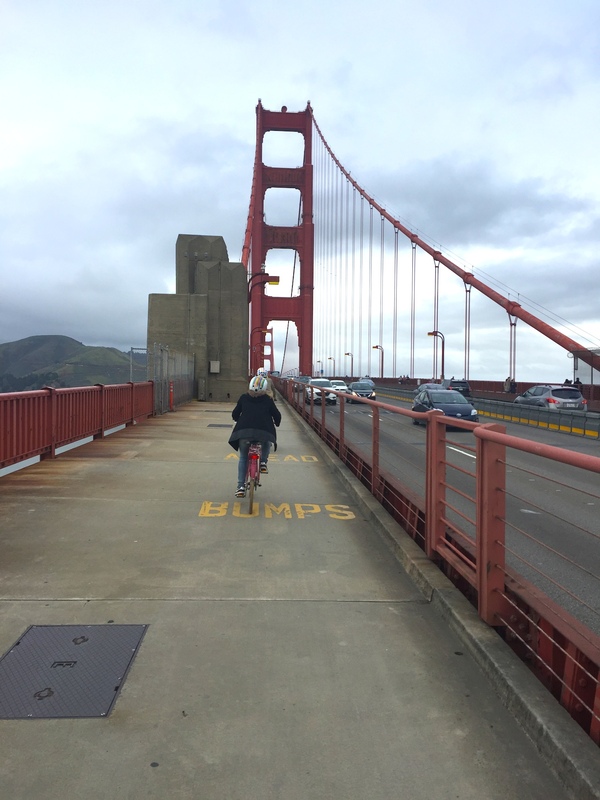 Once you cross the bridge on the west side, you will see a marked path for bikes that leads to a parking. Follow this path and go down the hill while crossing the parking lot. You will face a road with a gate that does not allow cars to keep going, but bikes and pedestrians are ok to go. 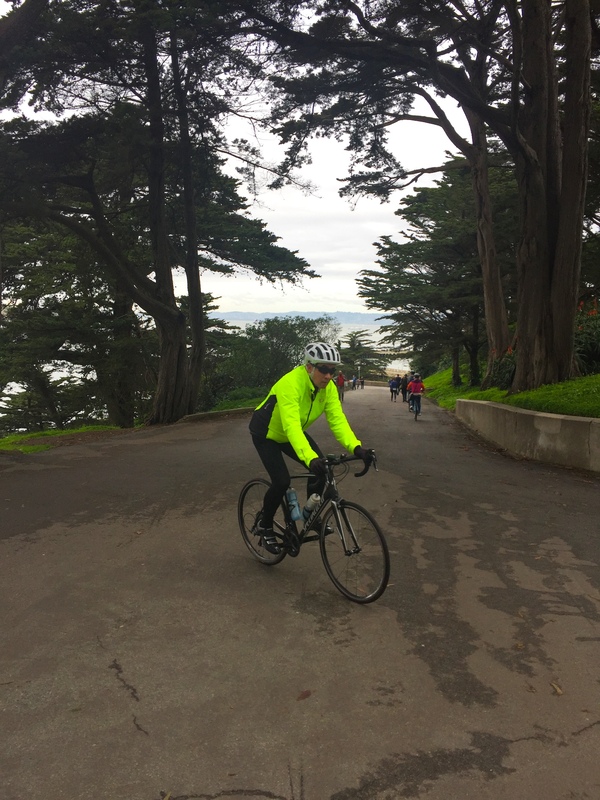 Follow this road (there is a sign with directions to Fort Bayer and Sausalito) and then you will go down the hill – be careful, it is a really steep hill so please cycle cautiously. You will cross to the other side of the bridge below the tunnel and then you will get to a flat road on the side of the bay. To make it clearer in below satellite image you see where you need to turn left on the parking and then down to cross the bridge to the other side. 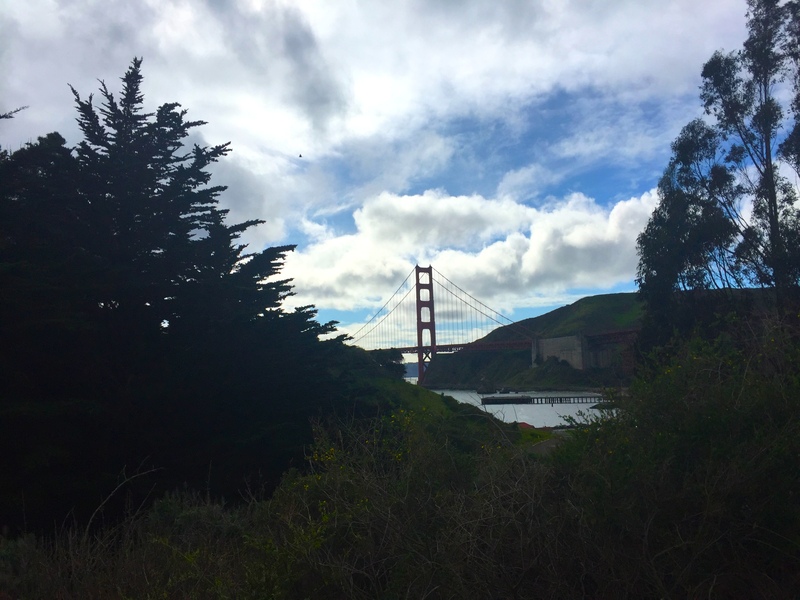 Once you get to East Road, you will admire the most beautiful views of San Francisco and the bridge! 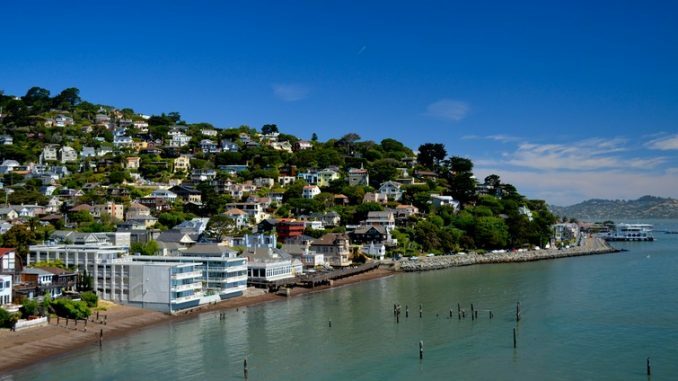 Sausalito is beautiful, very green and residential, and you will see a lot of pretty hidden pathways and houses on the way to the little centre. Once in there, we did not stay long as we had plans in the city later, but we wanted to have a great and deserved lunch. We locked our bikes in front of the ferry pier and bought our tickets to be safe. 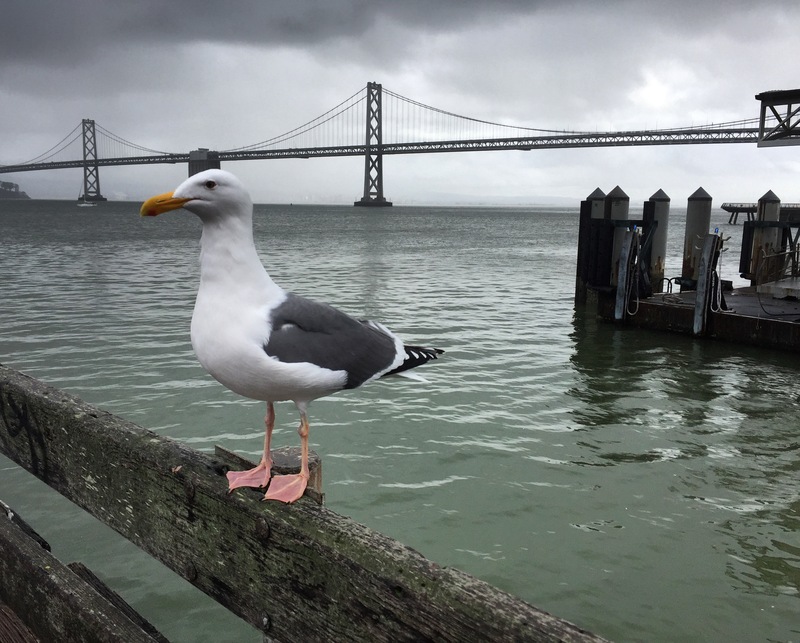 You can either get back to the Ferry Building (you can buy tickets in advance at Golden Gate Ferry) or to the Fisherman’s Wharf, Pier 39 (buy tickets at Bluee and gold fleet) Check the departure times before you go sightseeing so you plan accordingly. Finally, we head to Barrel House Tavern for a refreshing beer and full topped salad. Well deserved! After our lunch, we headed back to San Francisco by ferry, which took about 50 minutes to the Fisherman’s Wharf. We had to queue for a bit, so better to get at least 15 minutes before the departure time. Hope you find this information useful. I would highly recommend you make this trip if you are in San Francisco, it will be unforgettable.